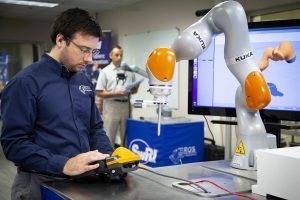 Southwest Research Institute (SwRI) scientists have developed a new solution that enables industrial robots to scan and manipulate metallic objects. The solution – backed by the ROS-Industrial – integrates intelligent part reconstruction using the Robot Operating System (ROS2) framework to improve 3D image perception. This should enhance robotic machine vision that deals with shiny objects in a better way and help them autonomously send and finish parts. “This is a great case study in the benefits and challenges of integrating ROS2 into industrial robotics,” says SwRI manager Matt Robinson. The latest ROS-I solution uses ROS2 to integrate cameras affixed to a robotic arm, collecting point cloud data at a high frame-rate to create a 3D output mesh that optimizes path planning. This has so far proven to be difficult as machine vision cameras and algorithms struggle to render accurate 3D images of metallic objects due to the “visual noise” that scatters off highly reflective surfaces. This in turn limits automation of welding and surface finishing processes in aerospace and automotive manufacturing. SwRI and ROS-Industrial have now joined forces to overcome this by integrating truncated sign distance field algorithms that stitch together several images, or point clouds, at a higher rate. The solution uses Trajectory Optimization for Motion Planning (TrajOpt), within the ROS-Industrial Scan-N-Plan framework, to enable real-time trajectory planning from 3D scan data. The project also sheds light on the benefits of a ROS-based approach, as it is hardware agnostic.